The worst tornadoes to hit parts of the United States in decades have left 44 people dead, stripping roofs off houses and tossing mobile homes into the air like toys, emergency officials said Sunday. The trail of destruction began on Thursday evening in Oklahoma, where a giant twister almost wiped out the small town of Tushka -- population 350 -- tearing up most of its homes and businesses and killing two elderly residents. The storm system strengthened and expanded on Friday, whipping up hundreds more tornadoes that barreled through Arkansas, Mississippi, Alabama and North Carolina, before petering out in Virginia on Saturday night. "It\'s the most significant damage by a tornado since the early 80s," Governor Beverly Perdue told reporters in Raleigh, capital of worst-hit North Carolina, where 23 people died. Among seven people killed in Alabama were a mother and her two children sheltering inside their mobile home when it was thrown some 500 feet (150 meters) into the woods, landing on its roof. Seven others died in Arkansas, four in Virginia, and one in Mississippi. Falling trees snapped power lines and came crashing down on cars and houses, killing occupants and causing widespread damage. Witnesses described hailstones the size of grapefruit. 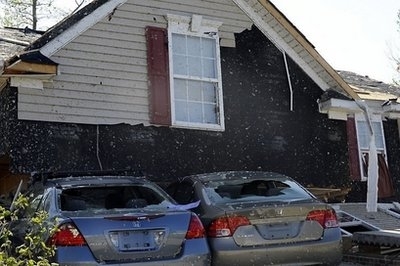 "This is the worst storm, tornado-wise, since 1984," Patty McQuillan, a spokeswoman from the Federal Emergency Management Agency (FEMA) in Raleigh, told AFP. 1984 saw the most destructive tornadoes in more than a century, with twisters sweeping through Georgia, the Carolinas and Virginia, killing 57 people and injuring more than 1,000. "I actually do remember the last one," said McQuillan. "I believe that the destruction may even be greater this time than it was in 1984." More than 60 homes in North Carolina were destroyed and more than 400 others sustained heavy damage. Aerial footage showed a vast Lowe\'s home improvement store obliterated with no roof and flattened walls. "I\'ve never seen anything like this in my life," Perdue told local media. "There is a tremendous amount of property damage and damage to people\'s lives. The hardest is for the people whose lives have been devastated." The governor declared a state of emergency on Saturday night to loosen up federal funds for what promises to be a long and painful recovery. "The state of emergency allows the governor to deploy the necessary assets to respond to and recover from the storm and it\'s also a prerequisite for asking for federal disaster assistance," explained McQuillan. The biggest toll in one area was 14 in North Carolina\'s Bertie County, which has a population of less than 20,000, according to the last census figures. "We\'ve had hurricanes, we\'ve had floods, but we\'ve never seen the loss of life we\'re seeing here," county official Zee Lamb told CNN, describing the vast complex of tornadoes that tore through the area. "It was estimated about a half-mile to three-quarters of a mile wide and it lasted for about six to eight, 10 miles through the county," Lamb said. Sam Bennett, 35, and his wife had just put their son, who turns two next week, down for a nap when they realized the storm was bearing down on their building in Raleigh. "We hustled the dogs and the baby into the back rooms," Bennett told AFP. "It got louder and louder and we heard a couple of booms and the fire alarm went off." The ceiling above them collapsed and water came pouring into their apartment, but the Bennetts could count themselves among the lucky ones -- at least they survived and their home is salvageable. "The tornado outbreak led to a total of 241 tornado reports in 14 states over the three-day period," said Meghan Evans from Accuweather.com. "This will likely rank this tornado outbreak among the largest in history." The meteorologist said there had been three main contributory factors: a powerful jet stream, abundant moisture and a strong cold front plowing across the South. "A powerful jet stream helped to enhance the thunderstorm growth, while moisture surging in from the Gulf of Mexico acted as fuel for the thunderstorms." Though more fatalities occurred in tornado outbreaks in 2008 (57) and 1985 (76), experts believe this weekend could have set a new record for the number of twisters over a three-day period. It is feared the damage will run into the billions of dollars.